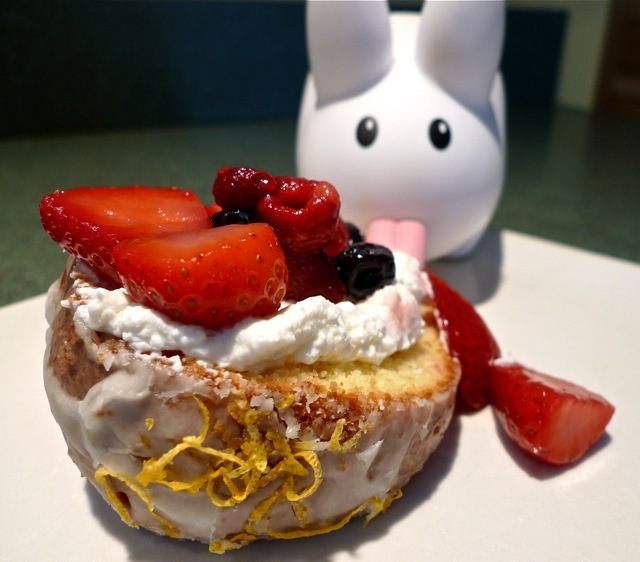 ...make Lemon Pound Cake! Sadly, Pipkin's most recent baking adventure resulted in a mushy, gloopy mess. He'll have to give it another try, but that particular cake was for a party and Pipkin needed to bake another cake right away. 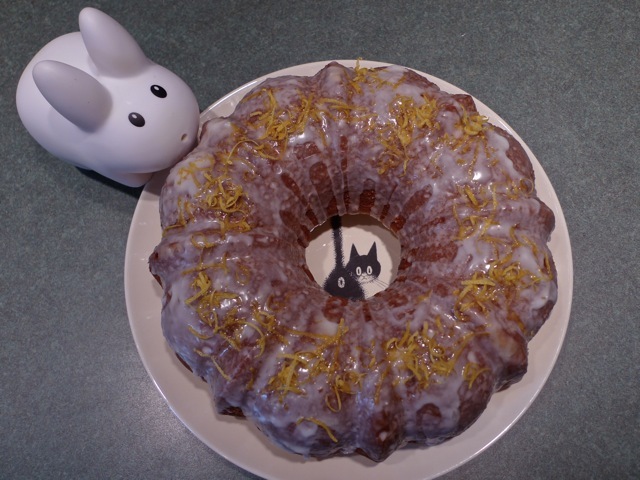 He had a lot of lemons so...Lemon Pound Cake sounded good, with a lemon glaze and lemon zest. A big dollop of whip cream and some berries on top and Pipkin's already forgotten about...was there something to forget about? Click here for a printable recipe. Preheat oven to 350°F, with rack in the lowest position. Grease and lightly flour a 12 cup bundt pan. In a small bowl, whisk together the buttermilk, lemon zest and lemon juice. In a medium bowl, sift together the flour, salt, baking soda and baking powder. With an electric mixer, cream together the butter and sugar until light and fluffy. Beat in the eggs one at a time. With mixer on low, add the flour mixture in three parts alternating with the buttermilk mixture in two part, starting and ending with the flour mixture. Beat until just smooth, but do not overmix. Pour into the prepared pan and bake at 350°F until a toothpick inserted in the center of the cake comes out clean, for 50 - 60 minutes. Allow to cool for 15 minutes in the pan before turning out onto a wire rack to cool. For the lemon glaze, slowly mix in the confectioners' sugar into the lemon juice until you reach the desired consistency, which should be thick, but pourable. Pour slowly over cooled cake. Before the glaze dries, sprinkle cake with lemon zest. Serve after glaze has hardened, and keep in an airtight container. Yield: One 12 cup bundt cake pan, 12-24 slices, depending on how big you like your slices! Well I'm glad some one enjoyed it!